Ceramics are crafts for practical use and mankind’s first-ever invention of the kind that involve chemical changes. Many aesthetically splendid works of art have been produced during the long history of ceramics. 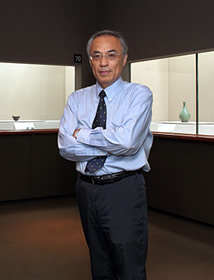 East Asian ceramics, in particular, have been highly praised and appreciated worldwide. Many ceramic pieces in the collection of The Museum of Oriental Ceramics, Osaka have been collected primarily for the purpose of appreciating them as works of art. As a result, the collection as a whole may not represent a complete history of ceramics. However, for those who wish to thoroughly appreciate the artistry of the ceramic pieces, the Museum provides a perfect viewing environment. It boasts one of the world’s finest collections of ceramics. In addition to that, various views have been given to the manner of display so that visitors can fully enjoy the ceramic pieces as forms of art in a relaxed atmosphere. The gallery with natural light display is one of such means to show the ware as close to its natural state as possible. We suggest you find a favorite ceramic piece or two from our collection. Perhaps such a piece can give you a different, fresh perspective every time you see it again. We sincerely hope that you will have a fruitful experience in this exhibition space with world-renowned ceramic works of art.